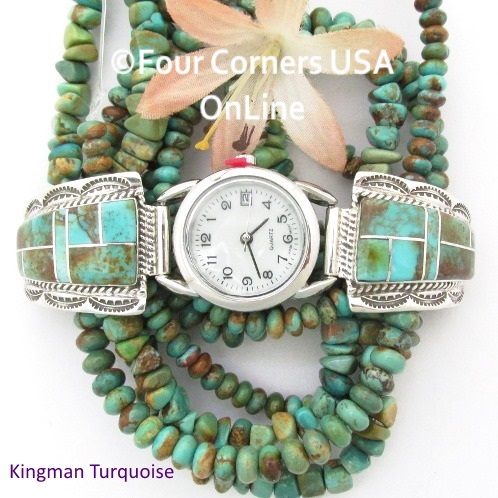 Authentic Native American Navajo and Zuni Indian handmade Artisan Sterling Silver Watches, Watch Bands, Watch Tips and Sterling Leather Watch Straps for Men and Women in all your favorite Southwestern Designs and Stones. Although we categorize our Native American Watches as Men's Sterling Silver Watches and Women's Sterling Silver Watches, it is only a suggestion as most Native American Jewelry could certainly be considered unisex. We have had many Women buying Men's Watches for a larger bulkier look and parents buying Women's watches for their tween boys like Badger (Bear) Paw with Turquoise being very popular. The primary difference between Men's Watches and Women's Watches is simply wrist size, watch face size and watch tip size. Our Leather and Sterling Watches and Watch Straps are a perfect example of Unisex Native American Jewelry. These handtooled leather straps with Sterling braiding and Concho accents offer long adjustable straps for larger wrists. We offer these leather watch straps with and without Watch Faces for your convenience and to fit your personal style. Looking for the perfect Watch Face Dial for your Native American Sterling Watch? Check out our Watch Faces for Women or Watch Faces for Men to choose a unique look for your favorite watch. All Native American Sterling Silver Watches and Watch Accessories are On Sale Now! Shop Men's Sterling Watches, Women's Sterling Watches, replacement Flex Straps in various lengths and widths for both Men's and Women's Watches, Men's Watch Faces, Women's Watch Faces including all our Mohave Purple Turquoise Stone Watch Faces, Mohave Green Turquoise Stone Watch Faces and Apple Coral Watch Faces.